Glyphs are great tools to use with your homeschooler and in the classroom. 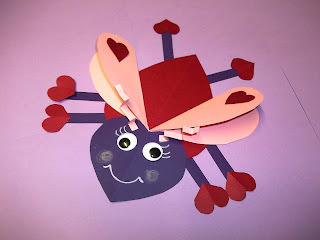 This Valentine's Day, use a bug glyph in your classroom as a craft. You can integrate art, writing, and math in a cinch and have a great take-home project or decoration for your classroom bulletin boards. Instead of putting together a pre-made product like those foam stickers, students make choices based on how they complete a glyph question form. For example, a question could ask students if they know of anyone who was born on Valentine's Day? If they answer yes, then they would, for example, add long straight legs to their Valentine Bug. If they answer no, then they would add short folded legs to the bug. The questionnaire process continues as the child builds his unique creation! But wait! Didn't I saw something about math? Yes, now it's time for math, but shh, don't tell the students! Learning should be fun and glyphs are a way to make that happen. Student then use a glyph key to analyze their classmates creations. For example, they could look at the Love Bug legs and create a graph that illustrates how many of their classmates know someone born on Valentine's Day. How cool is that? They can even create graphs of each element on the Love Bug. You can add more math skills and give students two Love Bugs and ask them to complete a Venn Diagram. Even better, ask them to write about their bug, a classmate's Love Bug, or even compare or contrast two Love Bugs.